It’s still dark when Madeleine, Clay, Justin and I meet at Madeleine’s house. Though this isn’t the earliest I’ve ever gotten up, it’s definitely the earliest I’ve gotten up to poke around Memphis recycling bins. For Madeleine Edwards and Clay Ayers of Get Green Recycleworks, however, this is just another day at work. We hop into Madeleine’s van and park next to an alley filled with the remains of a rockin’ few days at a restaurant. “If you want to smell like you’ve been drinking at 6:00 in the morning, this is a great business to be in,” says Madeleine as she empties a load of beer bottles into her trailer. The glass shimmers in the pink morning light. Madeleine founded her recycling company in 2008 after reading about Margot McNeeley and Project Green Fork. This Memphis-based non-profit certifies restaurants in green practices, such as using compostable packaging and avoiding toxic cleaners. Margot needed someone to collect recyclable materials from businesses since this service was not offered by the city. Madeleine was coming off several years as a stay-at-home parent and was ready for a new venture. Get Green Recycleworks currently employs six people, most of them part-time. Madeleine, however, works full-time—sometimes more than full-time. She handles logistics, customer communications, route planning, equipment maintenance and purchasing. She also goes out for pickups. Madeleine is strong and lean from her days of lifting bins, sorting materials and cleaning containers. Her practical uniform of sneakers, green T-shirt and shorts suits the physical nature of this work. “My job is my ‘manual labor tan and fitness plan,’” says Madeleine as she tears packing tape off a cardboard box, flattens it and throws it into her van. Recycling bins tell surprisingly intimate stories. Over the course of a week, Café Eclectic may place 48 gallons of coffee grounds and hundreds of egg cartons into their alley for pick up. The Pumping Station, a bar, sets out hundreds of glass bottles and red and white paper straws. Folks at Wiseacre Brewing Co. remove packing tape and fold their cardboard boxes neatly. Madeleine and her team know a side of Memphis most of us never see: the morning after. Not all of the stories are pretty, though. Some loads are contaminated with food, which quickly becomes putrid in the humid Memphis climate. Other loads contain non-recyclables, also known as trash. This requires patient sorting and a strong stomach. Madeleine advises workers to never wear shoes they love since they get frequent splashes of compost and beer. For all of the challenges of this work, Madeleine and her employees are idealists, working from their values of sustainability and common good. “I like that I am having an effect on my own carbon footprint. When I go to work, it feels like I’m doing a good thing and I’ve made a difference in some small way,” says Clay. “It’s very concrete. You can look at everything that you move and say, ‘I kept that out of a landfill,’” adds Madeleine. And what virtuous, perhaps locally crafted, refreshment does Madeleine crave after a day of hauling hundreds of pounds of cardboard, glass and paper? “A big, tall glass of iced Coca-Cola. I know it’s not politically correct, but that’s the truth,” Madeleine says. I am relieved to know that even sustainability saints like Madeleine have tiny vices. Something Madeleine understands better than most is that recycled materials are a commodity. Commercial businesses have to pay for their waste to be taken to a dump. Or they could choose to divert those funds to Get Green Recycleworks, who then passes them along to local cardboard and aluminum recycling plants. In down markets, Madeleine has to pay tipping fees to the recycling plants. In good markets, she gets paid there too. After the local plants, recycled goods are bundled and sold again and eventually make their way to China, which purchases much of the U.S. recycling output. New products such as toilet paper or Adirondack chairs are then created and sold. Many factors can affect the stream of recycled goods in and out of the economy. Recently, the U.S. market has been down as Chinese companies reduced their purchases because of tariffs and increasingly contaminated loads. Madeleine sees numerous opportunities for new Memphis businesses within a recycling infrastructure. A local glass recycling plant would prevent bottles from being shipped to Atlanta. Packaging design can be improved. Recycling educators create new revenue streams for businesses. There is also a role for local and federal governments. “What needs to happen is that the cost of getting the raw material needs to be higher than using recovered materials. This can happen when governments choose to subsidize recycling rather than, say, the timber industry. Using raw materials should have an intrinsic cost to them,” says Madeleine. My last stop with Get Green Recycleworks is Dixie Waste Paper Company on Jackson Avenue. This is the place where scale begins to boggle the mind. Flattened cardboard boxes cover an area the size of a Kroger parking lot and are stacked 10 feet high in some places. Excavators and trailers keep the pile in constant flux. Madeleine parks the Get Green van and trailer on a huge scale before and after our visit. 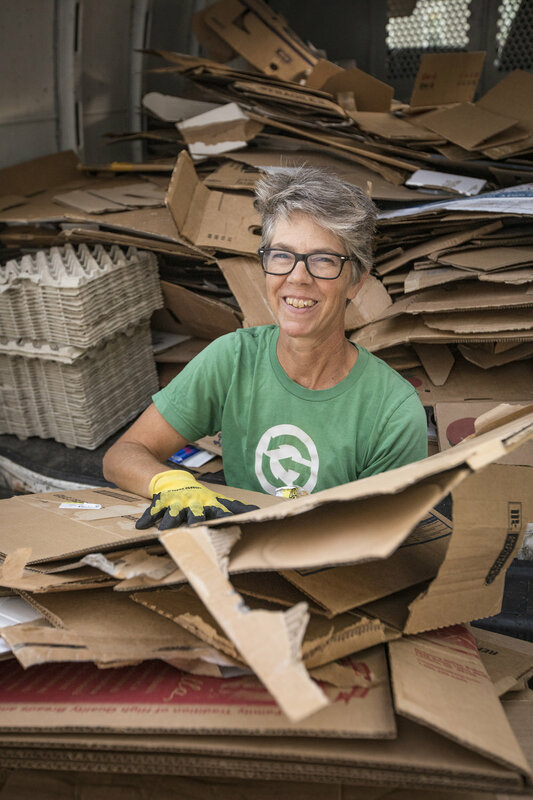 The Dixie proprietors purchase 520 pounds of cardboard from Get Green Recycleworks to send along to Kimberly Clark to make into toilet paper and craft paper (the outside, non-ridged layer of cardboard). Madeleine collects 11 dollars and change for her load. “This is just a drop in the bucket,” says Madeleine. Still dazzled from the size of that cardboard pile, I concede her point. We’ve visited just four businesses this morning but driven past dozens more. Apartments, schools, churches and individuals can also use Get Green’s services. The first decade of Get Green Recycleworks has seen many changes in the recycling landscape. The most important is a sharp increase in interest, which has been great for business. In the future, Madeleine wants Memphis to move away from single stream recycling, where everything is tossed into one bin to be sorted later. If individuals have to think about the material and type of each object, we become better recyclers, she believes. “We need to look at a country like Denmark and figure out how they achieve a 90 percent recycling rate, all of it sorted. They don’t have enough natural resources to feed the economy there so people just grow up recycling,” says Madeleine. The challenges of global climate change and of Memphis neighborhoods are daunting. Madeleine and her team at Get Green Recycleworks provide one answer to these demands with a local business, community partnerships and a clear mission. “If we don’t recycle, we’re literally going to be buried in our trash,” says Madeleine. The morning light is strong now, and I’m starting to see the potential Madeleine sees all over Memphis: more loads, ready for pick-up. Heidi Rupke spends her days tending chickens and children, and defending her garden against squirrels. Her current food obsession is making the perfect pavlova.